The Khatib is delivering the Friday sermon and as the congregation listens quietly, a train passes by in the distance, rustling the leaves in this suburb of Woking in the British county of Surrey. Rising above the trees, the bright green dome and minarets of the Shah Jahan Mosque are a sight to behold in this busy commuter town. While mosques are quite a common sight in the United Kingdom, what sets this one apart is not only the fact that it is the oldest purpose-built mosque in the country but also that it was commissioned by a Jewish man, Dr Gottlieb Wilhelm Leitner. If you find the idea of a Jewish man commissioning the first mosque in the United Kingdom a bit strange, then hold on to your hats! Leitner was also instrumental in the establishment of the University of the Punjab, right here in Pakistan. If this is news to you, that’s largely because of the fact that history in Pakistan has always been at the mercy of politics, and is routinely distorted (or ignored) to suit agendas and ideologies. The Shah Jahan Mosque was commissioned in 1889 by Leitner so as to provide a place of worship for Muslim students at his Oriental Institute. The cost of the mosque was borne by the ruler of the state of Bhopal, Begum Shah Jahan, after whom the mosque is named. The mosque is now a Grade 2 protected building in the UK, giving it a special status. Built by a Victorian architect named WI Chambers, the mosque has a traditional Indo-Saracen design, with geometric patterns and Arabic calligraphy being used for decoration. Chambers, who wasn’t exactly well-acquainted with mosque design, is said to have visited the Arab Hall in Leighton House, and the India Office Library for inspiration. The results speak for themselves, and Chambers is even said to have sought the help of a naval captain in order to ensure that the mosque faced Makkah precisely. The original mosque still stands today and can hold up to 60 worshippers, but since the weekly congregations far exceed this capacity, the mosque has also expanded to neighbouring buildings. In 2001, BBC Southern Counties Radio funded the building of a garden on the South side of the original Mosque. It now greets visitors to the mosque as they enter the grounds. 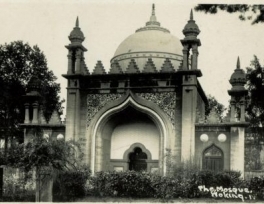 As Britain’s first purpose-built mosque, the Shah Jehan Mosque played an important role in the establishment of Islam in the UK and paved the way for the set up of the first cemetery for Muslims in the country. 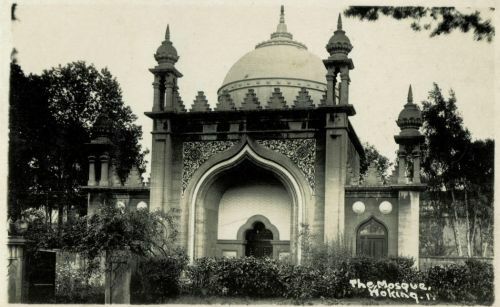 Woking’s Muslim Burial Ground was built during the First World War as the only designated place of burial for Muslim soldiers who died at the Indian Army Hospital in Brighton Pavilion. The Shah Jahan Mosque has become a centre for the local Muslim community in Surrey and every year hundreds of tourists of various faiths visit the mosque. “We hope to turn the mosque into an institution for Islamic learning in the hope of fostering peace and understanding,” said the prayer leader of the mosque, Sahibzada Nisar.